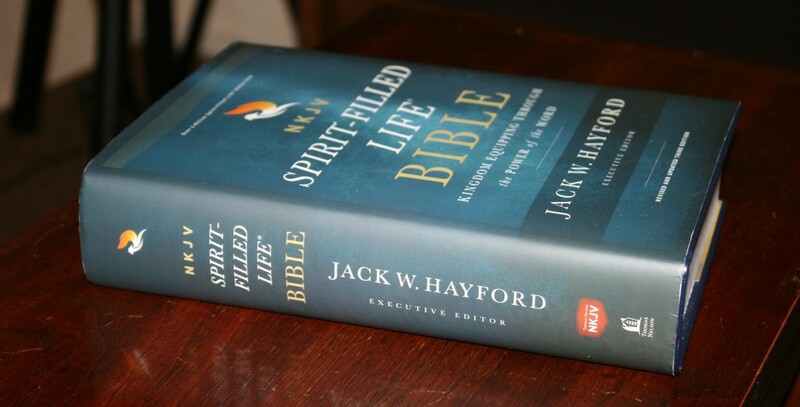 Thomas Nelson’s Spirit-Filled Life Bible, from a team (which includes new contributors) led by Jack Hayford (pastor of Church on the Way, and chancellor of The King’s University), is one of the most popular Pentecostal study Bibles on the market. It was recently revised and updated to produce a full-color 3rd edition. I’m reviewing the hardcover edition, ISBN: 9780529100146, made in China. This is a hardcover edition with dust jacket. 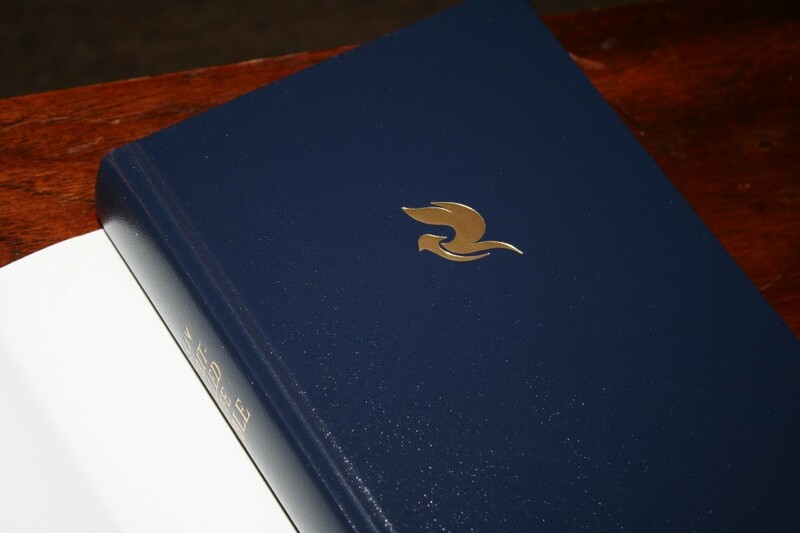 The dust jacket has a beautiful blue design with all of the sales info. The cover itself is black with a gold dove on the front and the title on the spine. It’s Smyth sewn and has no trouble staying open on any page. 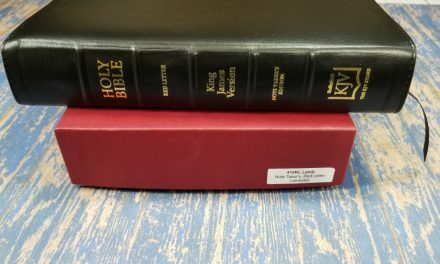 The spine rises upward in the center when the Bible is opened to help the pages lay flat. The overall size is 9.5 x 6.5 x 2″ and it weighs 3lbs, 11.1 oz. I’m just guessing, but the paper is probably around 30gsm. It’s off-white in color and has no glare under direct light. It’s fairly smooth. The texture isn’t rough but it doesn’t feel coated either. I had no issues turning pages. It’s decently opaque. The show-through is mostly noticeable when there’s color on the other side of the page. The test is presented in double-column paragraph format with poetry set to stanzas and letters indented. References and footnotes are placed in the center column. 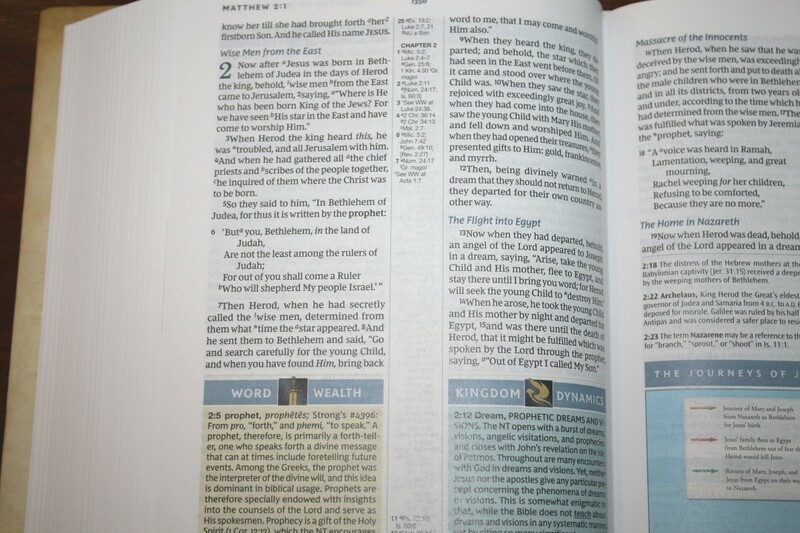 The header shows the page number in the center and the book name, chapter, and verse numbers in the outer column. The commentary is placed at the bottom of the page in two columns, separated from the text by a line. The typeface is around 9 point using the Comfort Print designed by 2K/Denmark. This is a red-letter edition. Both the black and red are dark and consistent throughout. I love this deep, rich, red. It has around 42 characters across with around 7-9 words per line. The words never feel too close. It isn’t printed with line-matching, but there are so many notes in the text that it wouldn’t make much difference. The text is still easy to read because there isn’t much show-through. It has reference and footnote keys in the text. Several words have an asterisk. These indicate there is a Word Wealth on that word. 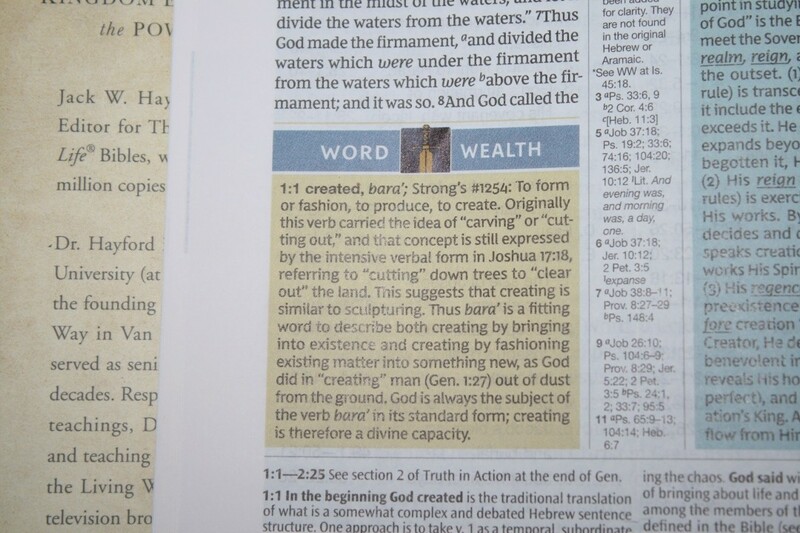 The center column, under that verse number, shows the reference where you can read the Word Wealth. 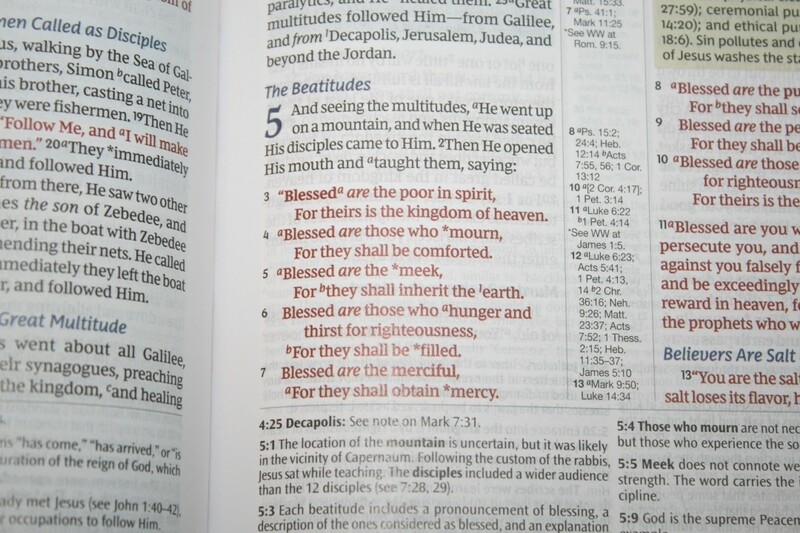 Throughout the text, you’ll see circled numbers in the margins. These are part of the Truth in Action studies. 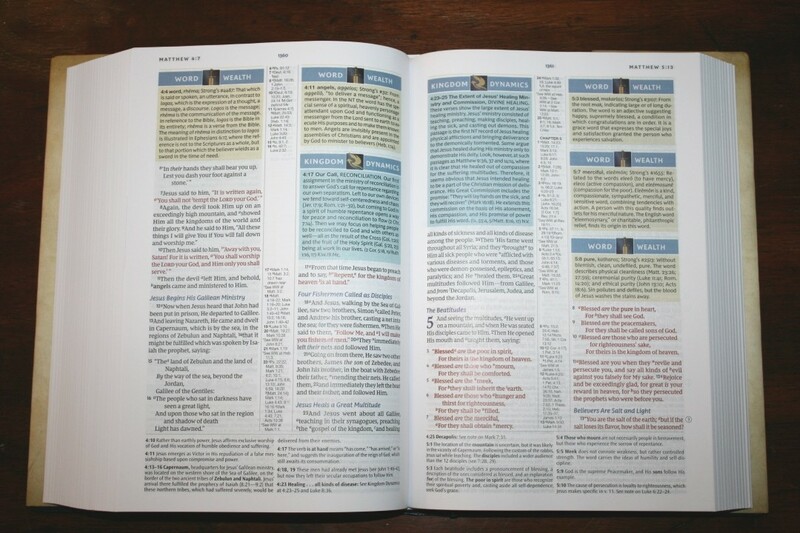 The cross-references and footnotes are in the center column. Those for the left column are at the top and those for the right column are at the bottom. This leaves some empty space on several pages, which can be used for small notes. 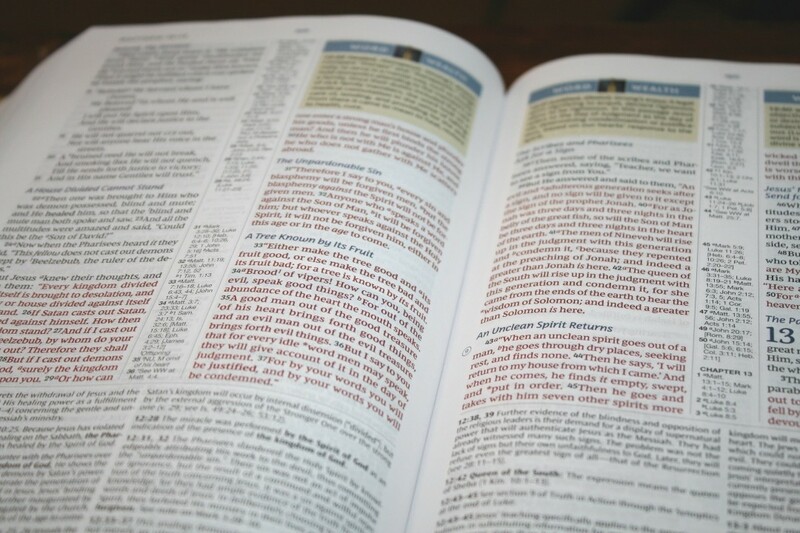 The footnotes are the standard NKJV notes and include information about manuscript variations. The NKJV has my favorite footnotes. 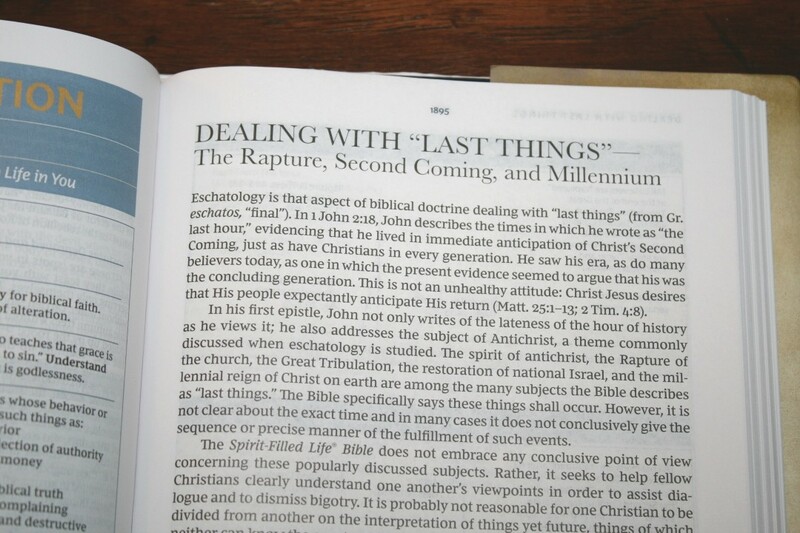 There are a lot of references, making this an excellent Bible for study and sermon prep. 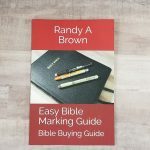 Book introductions take several pages and include information about the author, date, background, style, content, Christ revealed, the Holy Spirit at work, personal application, themes, keywords, and an outline. 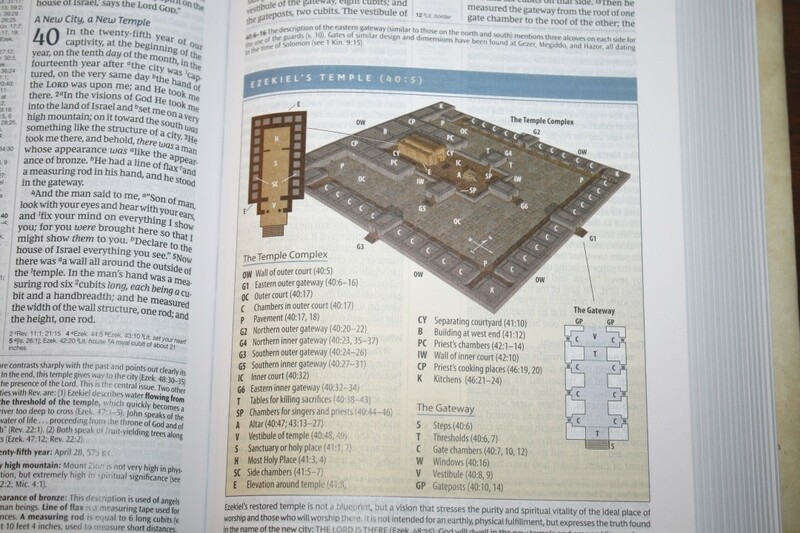 They’re well-written and are great for gaining insights on studying the book. Notes appear on just about every page. They stand out from the text with either colored blocks (these are placed within the columns of text) or at the bottom of the page. There are indexes in the front for most of the study material. Commentary – the commentary is placed in a much smaller font at the bottom of the page and covers either a single verse or a range of verses. It includes the chapter and verse number in bold. Some are simplified while others are quite detailed and include Scripture references, a range of views of other denominations, and a range of views within Pentecostalism. 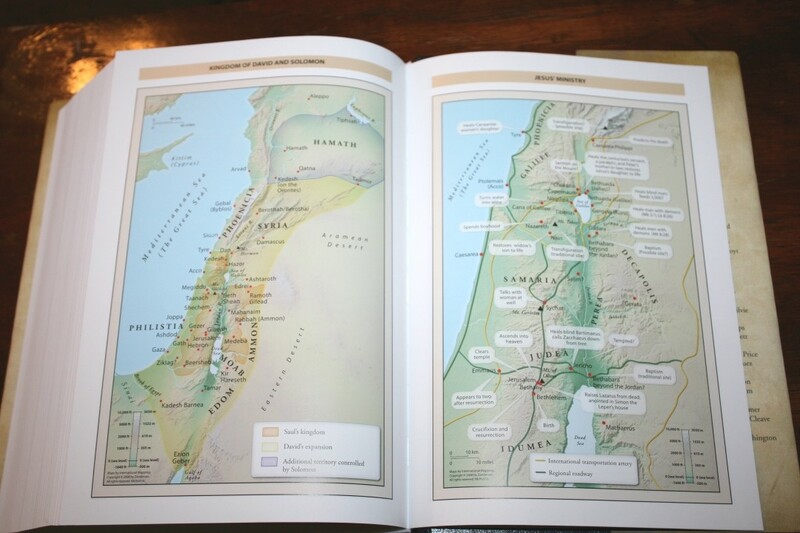 They also include full-color maps, charts, outlines, and illustrations. 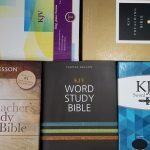 Word Wealth – this is over 650 word-studies on the Hebrew and Greek. They’re printed over a yellow background. They include the chapter and verse number, English transliteration, the original spelling in English, the Strong’s number, and definition. It also includes verses where it’s used including different definitions where appropriate. 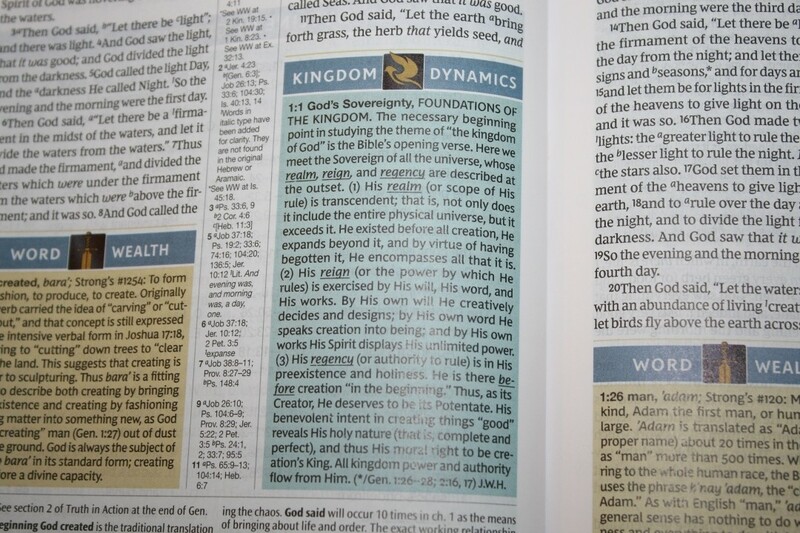 Kingdom Dynamics – this covers dozens of biblical themes and provides explanations of key points. They’re printed over a blue background. 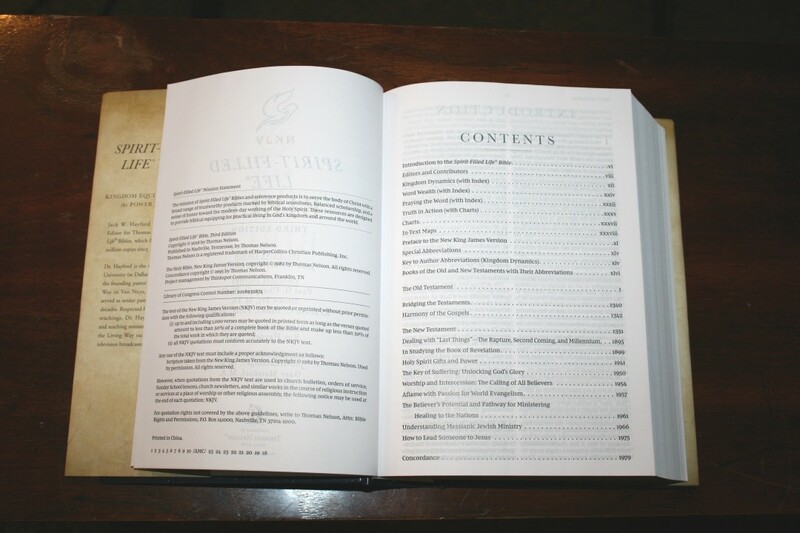 They include the chapter and verse number, the topic title, and description along with lots of references. These work as short topical articles. 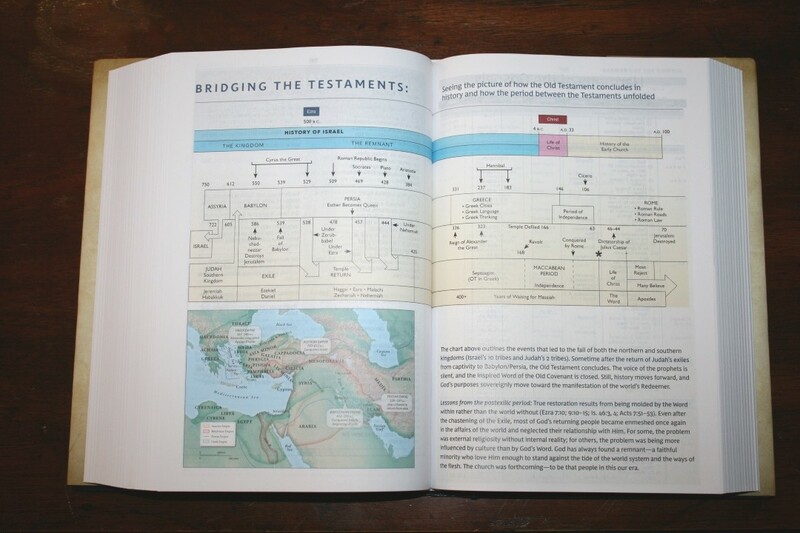 Truth in Action – these are thematic charts with practical applications from every book of the Bible. They provide three columns: Truth, Text, and Action. The Truth section shows a circled number. These numbers are found in the margins of that book. The number provides a title and a paragraph on that topic. The Text section is a center column that provides references that corresponds to the Action column. 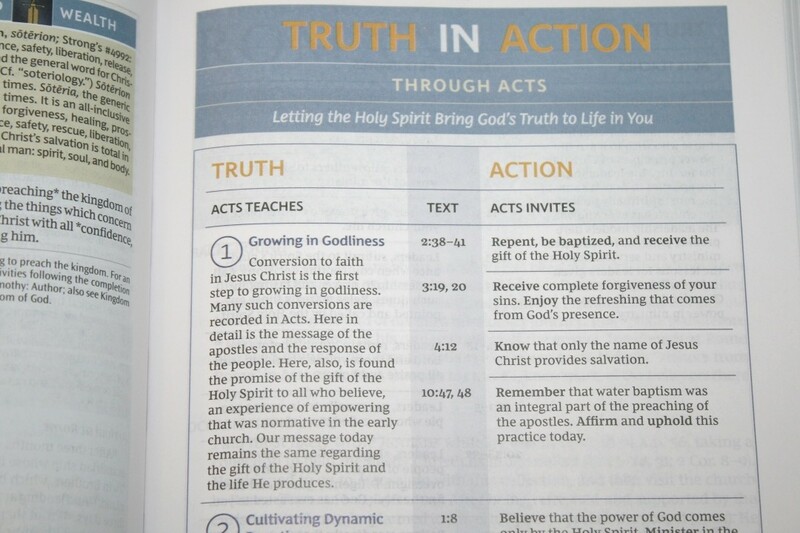 The Action section shows the different ways we are to apply the Truth. These make an excellent study or devotional. 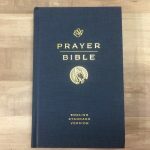 Praying the Word – 192 prayers that are based on Scriptural passages. 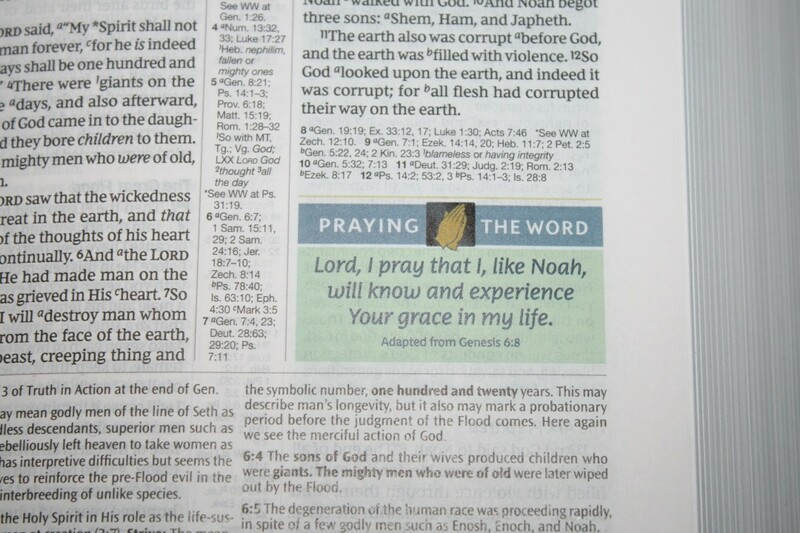 They’re printed with a green background in giant print and provide the Scripture reference they’re adapted from. They basically reword a verse into a short prayer. 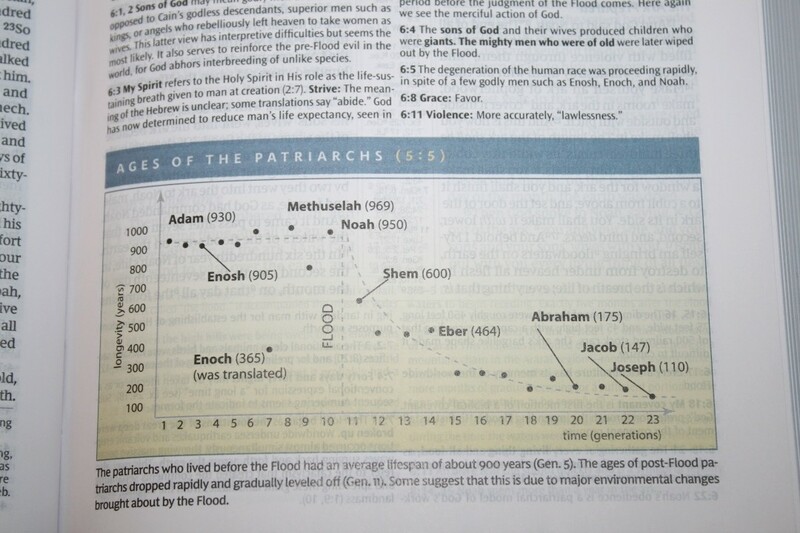 Charts – there are a few charts between the Testaments that are great for study. 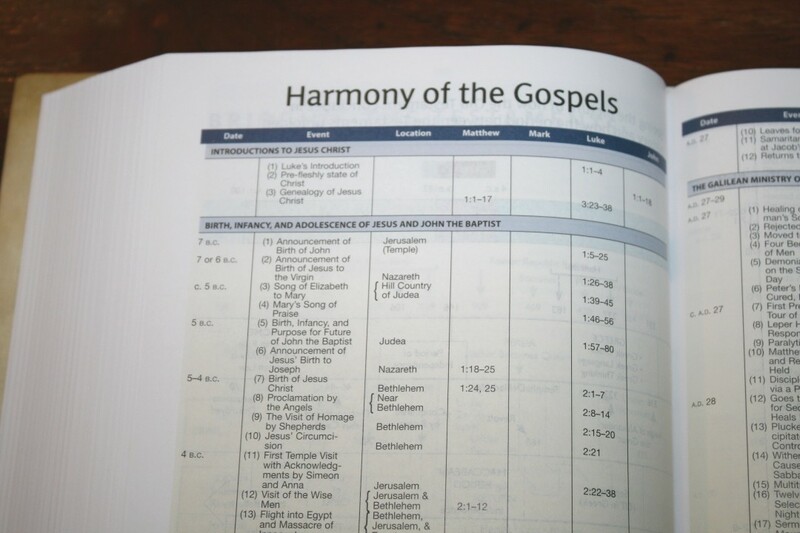 They include Bridging the Testaments and Harmony of the Gospels. 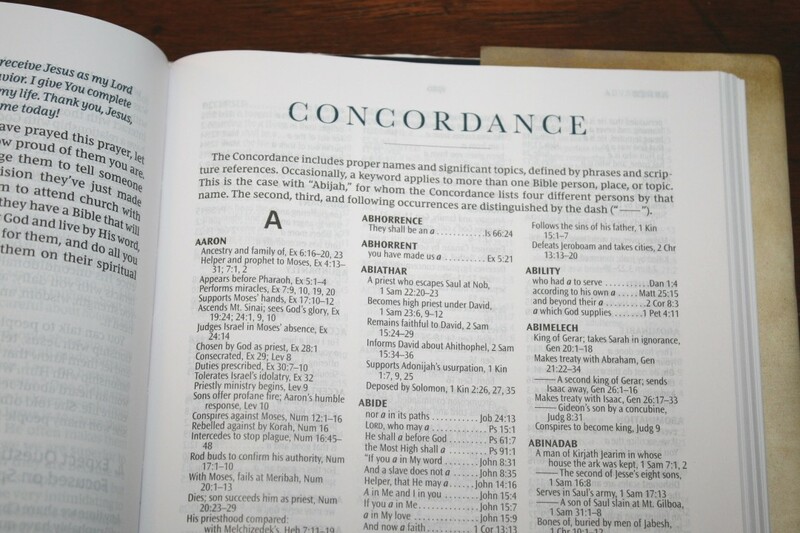 The concordance is 146 pages with three columns per page. The keywords are in bold and entries are large enough to read without my glasses. For names, it includes some topical information with references. 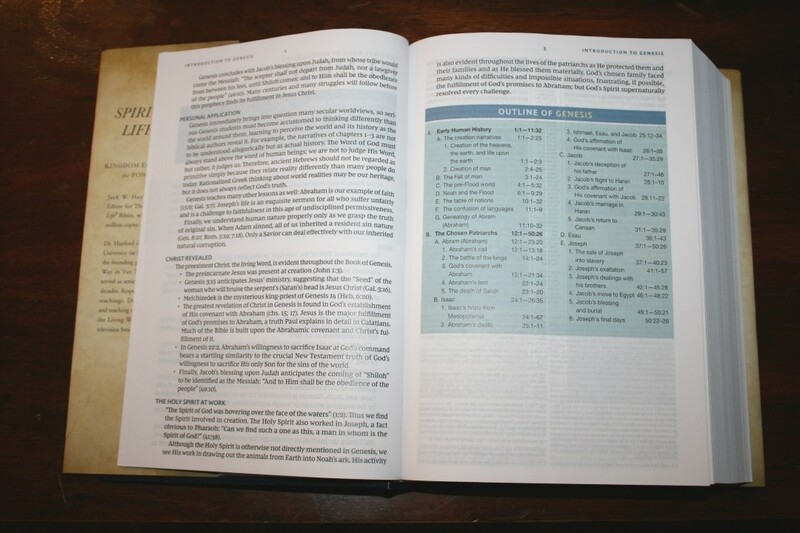 It has a lot of entries and is excellent for study and sermon prep. 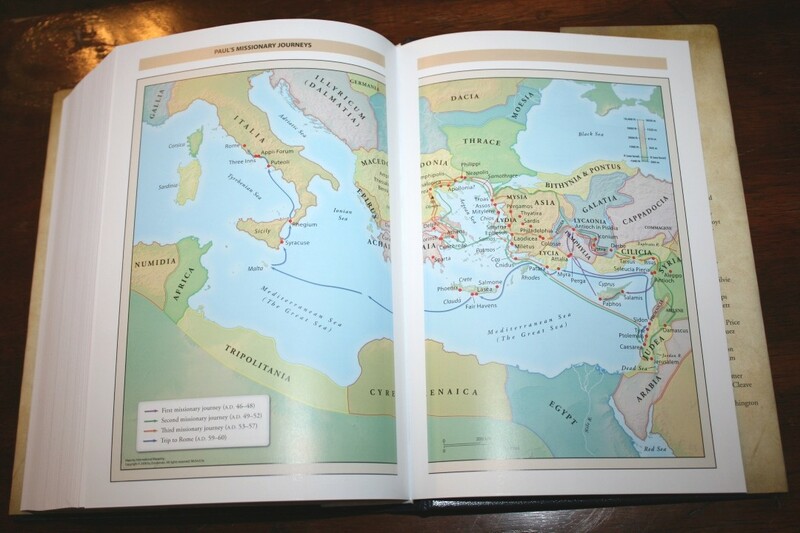 There are 7 full-color maps on 8 pages of thick glossy paper. 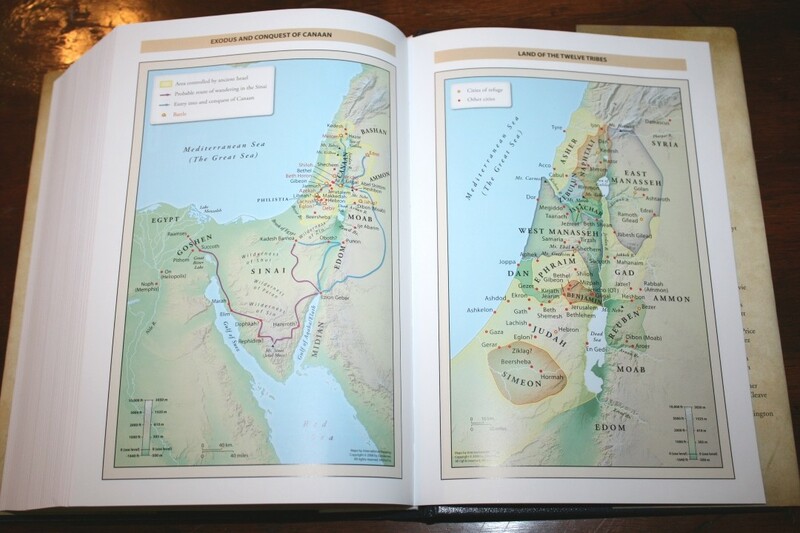 They’re from Zondervan and include distance, topography, journeys, cities, possible city locations, battles, kingdoms, roadways, transportation arteries, locations of events, dates, routes, and water. It doesn’t include an index, but they are labeled well. I love the colors. These are some of my favorite colors for maps. 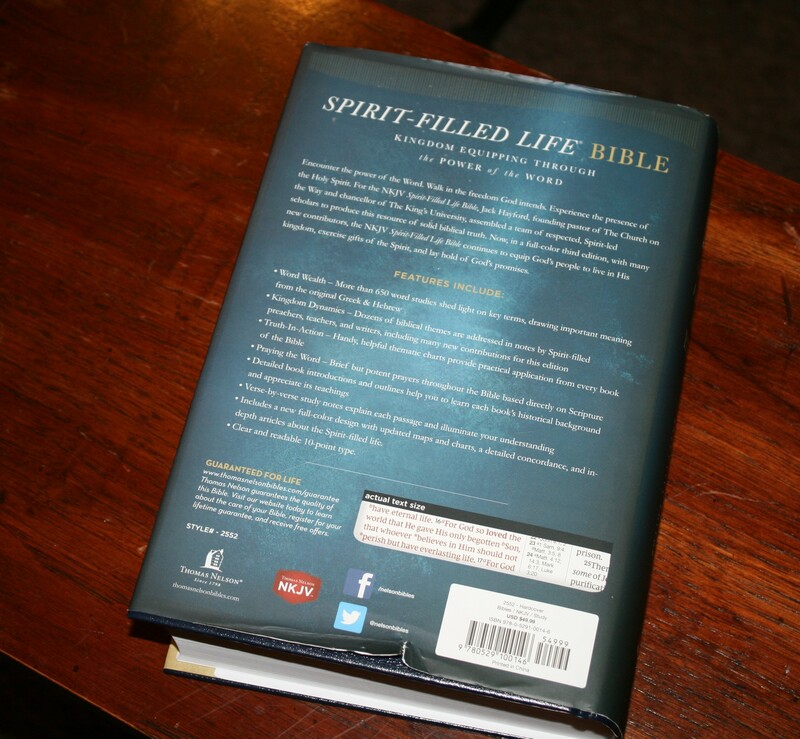 Thomas Nelson’s 3rd edition of the Spirit-Filled Life Bible is an excellent study Bible from a Pentecostal perspective. It’s good to see it produced in color. Most of the color is the background behind the study material. It does have a lot of study material on practically every page. I like that it includes smaller articles near the topics they correspond to rather than having fewer but larger articles in the back. 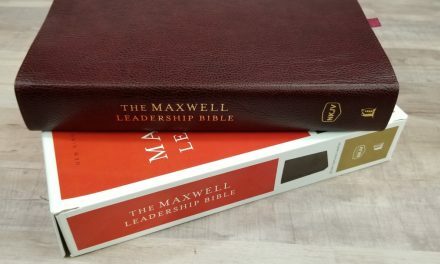 I’d like to see more photos and illustrations, but that would add to the size of this Bible and it’s probably large enough as it is. 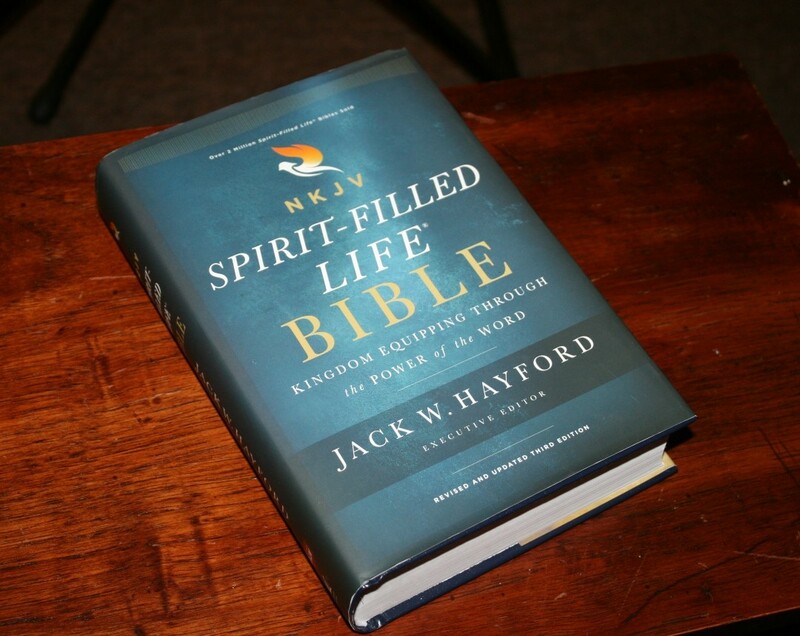 I recommend the Spirit-Filled Life Bible to anyone interested in notes from a Pentecostal view. I have had the genuine leather version for about an hour and I thought I’d share my first impressions. The leather is a cross between smooth and pebbled. It feels nice. Not Schuyler nice, but at less than half the price of goatskin (I paid $62), very good. Liner is paste on vinyl, similar to the 2nd edition. 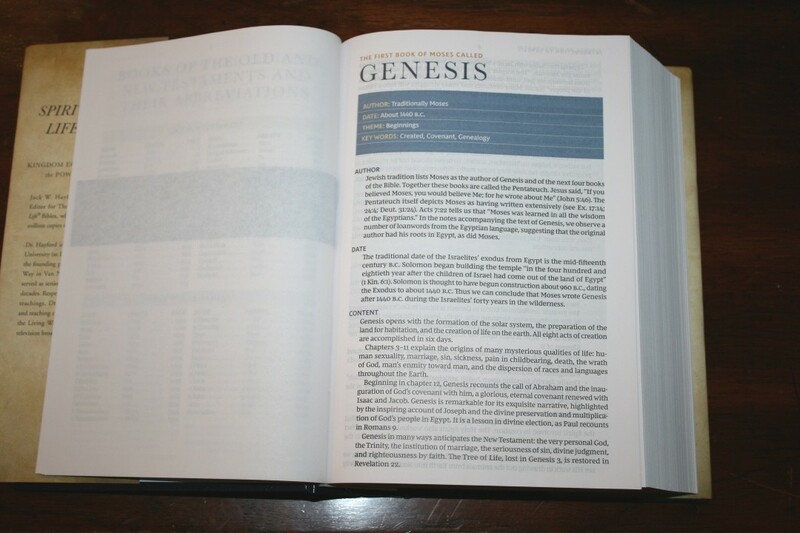 Bible lays flat at Genesis 1. Pages feel coated, easy to turn. As you stated, show through is there opposite color blocked info but not distracting in any way. Text is readable 9 font. Small notes don’t bother me because they are used as needed for reference. Haven’t looked at many notes yet, but content seems same as previous edition (neutral factor: previous content was great, just wish for more of it). Know there are more word wealths, which was my favorite part of 2nd edition. Only area of weakness: weight. This thing is a beast, at 2 inches thick and over 4 lbs. Makes my Schuyler Quentel seem light by comparison and that Bible isn’t exactly light. I will use this as desk reference and would teach with it on a lecture, but would never carry this around or teach holding it my hand. I sat the 2nd edition (called New S.F.L.B.) side by side with the 3rd edition to compare content. In short, all changes in the 3rd improve on the previous edition. 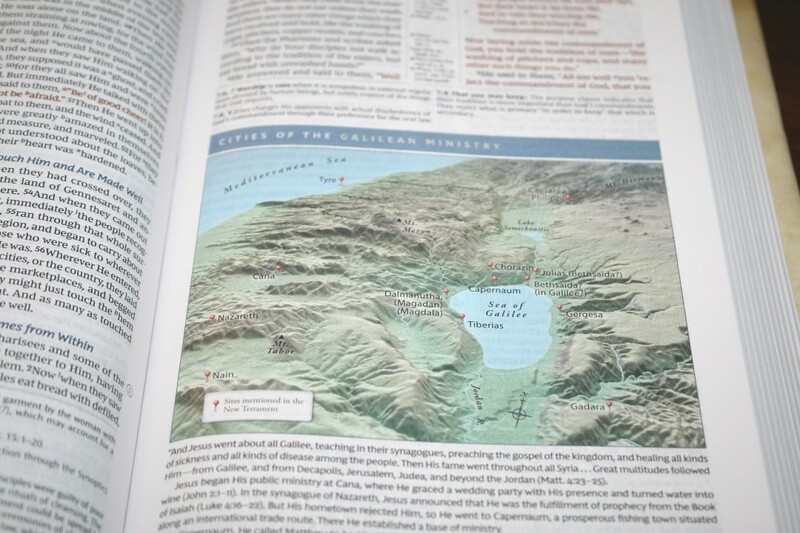 The full color vastly improves the appearance of the page, especially in maps and charts. 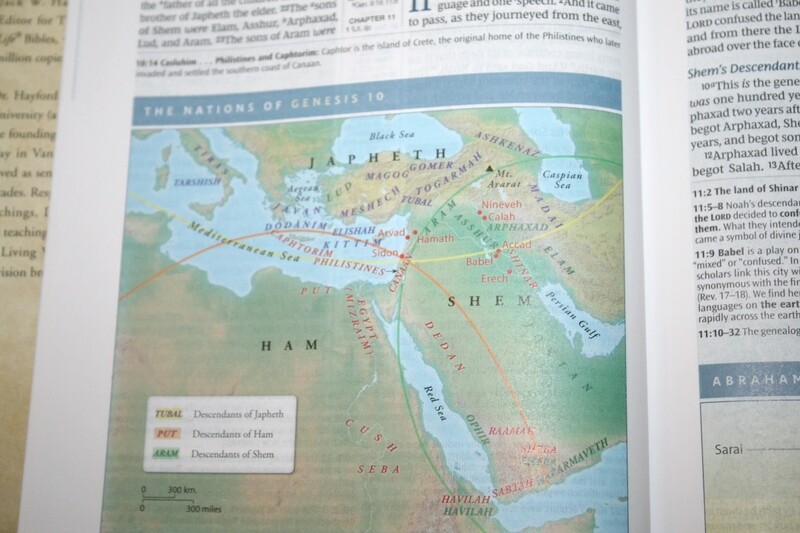 There are more Word Wealths, more Kingdom Dynamics, and the new Praying the Word, all inserted in color blocks within the text. 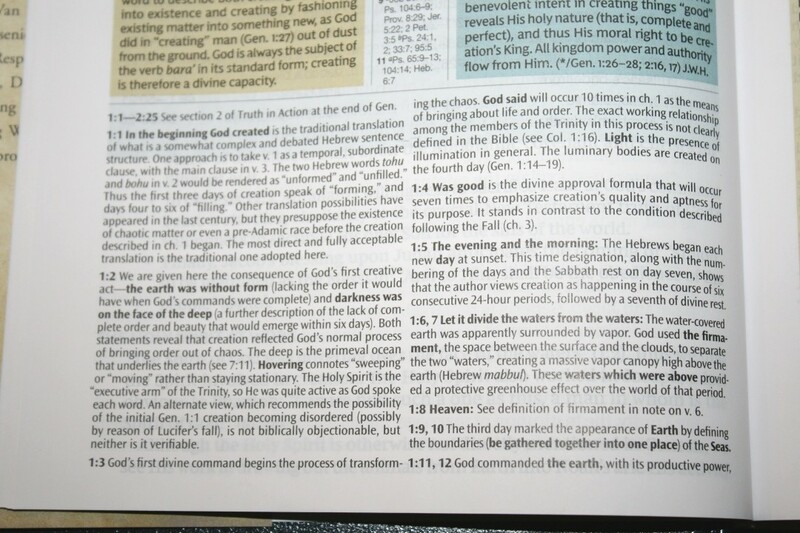 The Kingdom Dynamics occasionally have been revised in content. E.g. the Seed Faith segments written by Oral Roberts in the 2nd have been replaced by Blessed Life content by Robert Morris. All this inserted content has been rearranged on the page and breaks up the text in less intrusive fashion than before. E.g. 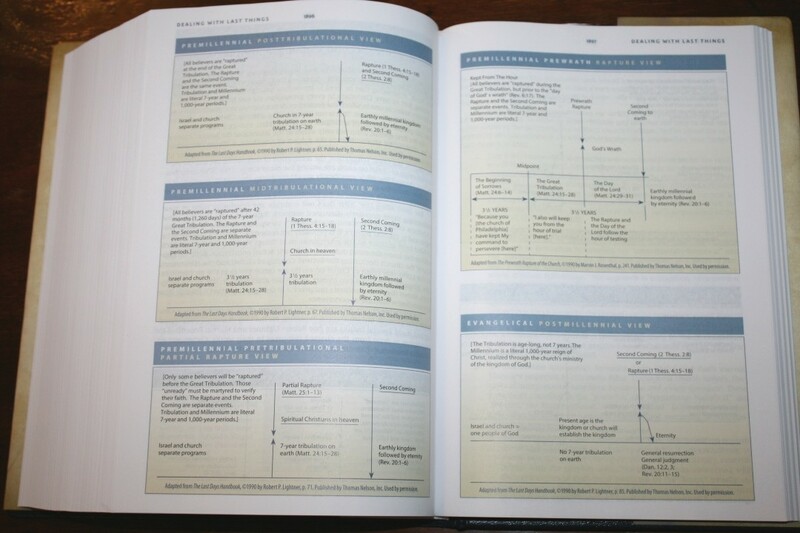 in the 2nd edition, the first Word Wealth and Kingdom Dynamics occurred right after Gen 1:1. 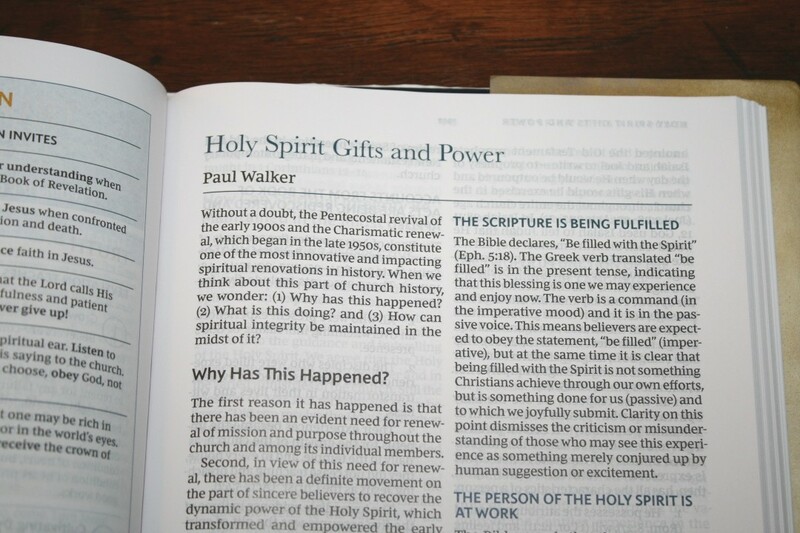 You had to turn the page to read Gen. 1:2. 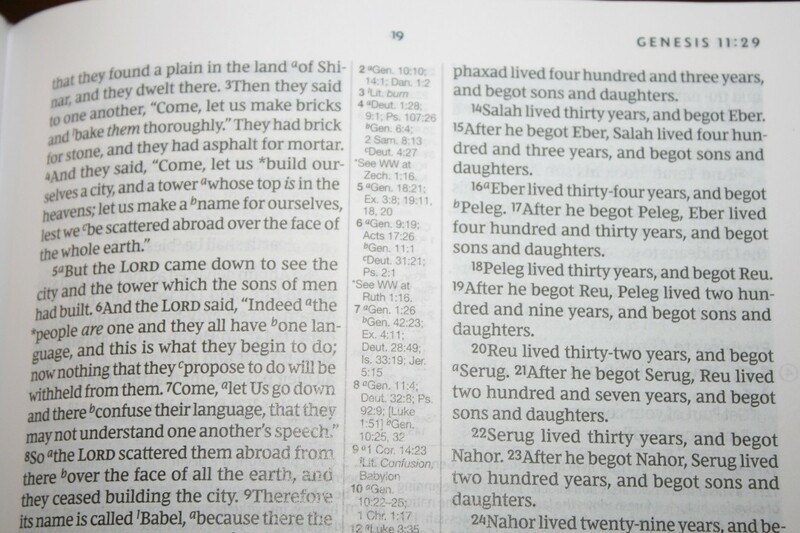 In the 3rd, Gen 1:1-11 is on one page with the insertions at bottom of the text, improving readability. 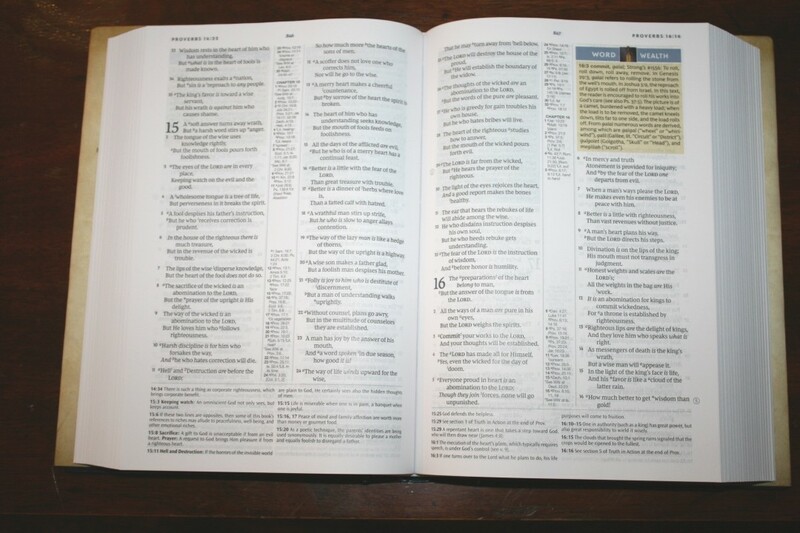 Speaking of the text, it is slightly larger in font, and written in paragraph format instead of verse by verse. Readability is improved. The chapter introductions are mostly the same, though there is some additional substantive commentary. Most significantly, they have been revised for grammatical clarity and reformatted for improved readability. The Truth In Action segments at he end of each book and the text in the footnotes are essentially the same, with some minor revisions for clarity. As I stated in my previous review, I am very pleased with the new edition. In every area except weight, the 3rd edition is better than the last. Considering the additional content, the trade off in weight is worth it. Thanks for sharing! This is excellent!